� Jennings and Matt Fuerbringer reunited in 2013 (after not playing together since 2009) for the Manhattan Beach Open and duo chalked up four wins against teams seeded in the top four en route to winning the tournament. � Jennings and Matt Fuerbringer won at least one AVP tournament each season from 2004-08. � His win in Seaside Heights in 2006, along with his wife's Kerri Walsh, made them the second married couple to win on the same weekend, joining Mike and Patty Dodd, who accomplished the feat four times. They repeated the achievement in the 2007 finale in San Francisco, then again in Manhattan Beach win 2013. � Jennings' partnership with Keenan to open the 2010 season marked his first event with a partner other than Fuerbringer since July 2007, snapping a string of 41 domestic and international team events played alongside Fuerbringer. � Jennings and Kevin Wong won an FIVB event in The Hague in 2010 after losing in the qualifier, only to reach the main draw via the lucky loser draw. The duo became the first FIVB team to win an event after earning a lucky loser berth. The tournament was just the second time the two had played together. 2015: Jennings played six AVP events with Billy Kolinske, with a best of third. He also played one tournament with Casebeer, finishing ninth. Jennings ended the year third in digs per set (4.99) and ninth in hitting percentage (.423). Jennings played in two FIVB events, one with both Casebeer and Kolinske, but did not advance from the qualifier in either one. 2014: Jennings formed a partnership with Jeremy Casebeer, playing six AVP events together with a best of third. He led the Tour in digs per set (5.78). Jennings played one FIVB tournament with Avery Drost, finishing 17th in Long Beach. 2013: Jennings played seven AVP events with five different partners. He reunited with Matt Fuerbringer in Manhattan Beach for the first time since 2009 and the duo won the title. On the FIVB Tour Jennings played four times with three different partners, and won a silver medal in Brazil with Phil Dalhausser in their only tournament playing together. 2012: Jennings formed a new partnership with Bill Strickland, reaching one main draw in five FIVB events. Domestically the duo had a best of seventh in three events. 2011: Jennings continued playing with Wong on the FIVB Tour, with a best of fifth in eight events together. Jennings also played twice internationally with different partners. Domestically he played four tournaments on three different tours with four different partners, winning one of those with Pedro Salgado. 2010: Jennings began a new partnership with Brad Keenan, placing ninth in their first two AVP events as well as their first two FIVB tournaments. On the AVP Tour the duo ended the season with a best of third in six events. They advanced to their first FIVB semifinal in the Moscow Grand Slam, their best finish in the 10 events together. Jennings played in the last two FIVB tournaments with Kevin Wong. In the FIVB season finale in The Hague, Jennings and Wong won the title, giving Jennings his first career international win. 2009: Jennings missed the AVP season opener with a foot injury. 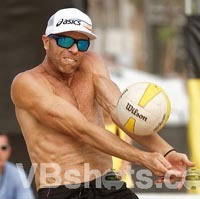 He and Fuerbringer had a best of third place on the AVP Tour, in Ocean City. Jennings led the tour in digs per game (5.65). On the FIVB Tour he and Fuerbringer earned a silver medal in Poland, in what was Jenning's first international title match, before placing fifth in the World Championships in Stavanger. They concluded their FIVB season with ninth-place matches in three Grand Slam events. 2008: Jennings and Fuerbringer played in seven semifinals, including Manhattan Beach, and in two finals, winning in San Diego. Jennings led the tour in both digs per game (5.57) and kills per game (7.60). In an effort to qualify for the Olympics, Jennings and Fuerbringer played eight FIVB events, with a best of third. They were the third U.S. team in the Olympic qualifying, and were the fourth highest ranked team worldwide not to qualify, due to country quotas.